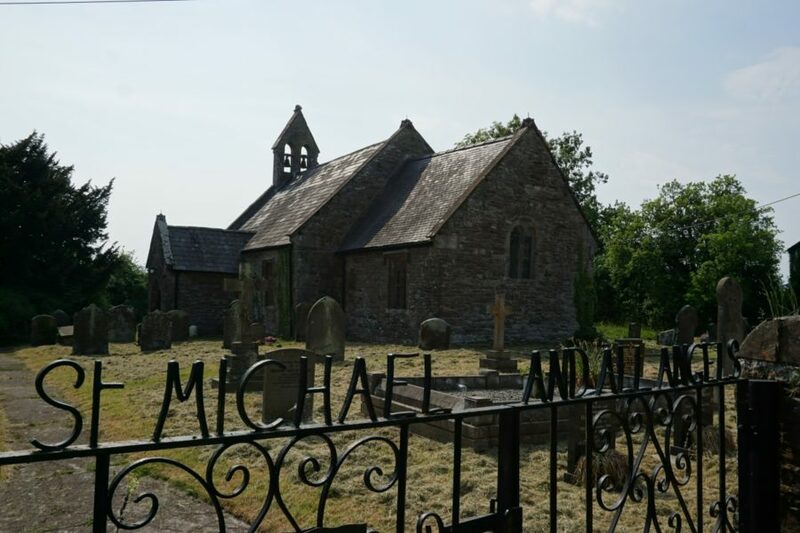 St Michael and All Angels is a small church built of Old Red Sandstone rubble. Grade I listed, it is located in the peaceful setting of Llantrisant Fawr, Monmouthshire. The south doorway, with its broad chamfered arch, elements of the lancet windows to the west and north walls, and the east window with two trefoil-headed lights place the origins of this building in the 13th or early 14th century. Two bells in the western turret are of 13th century date and are amongst the oldest in Monmouthshire. Unusually, therefore, the church and its bells are contemporaneous. The windows – dating from the 13th, 15th, 16th and 19th centuries – create an interesting architectural collage on the exterior. While small, heavily-eroded carved stone heads project from the west gable. The church is entered through the south porch, which contains a mutilated stoup. Once inside, one is immediately struck by the rood beam and screen at the chancel arch. The 15th century rood beam is carried by three stone corbels and retains a pierced, foliate trail of carved decoration. The screen below also has simple decoration, incorporating quatrefoil and Tudor rose carving, while a gold-leaf transfer-pattern of fleur-de-lys design was added in the late 19th century. The wagon roof to the nave, panelled with moulded ribs, also dates to the 15th century. To the west of the church, a baptistry, made of recycled medieval screen, encloses the font, which is 19th century octagonal bowl on a medieval shaft. The enclosure is rather roughly joined together and all trace of carved or painted decoration has been lost. J P Seddon of Pritchard & Seddon undertook a light-touch restoration of St Michael’s in 1853-54. Both the bell turret and pews – solid, heavy timber – are characteristic ‘Prichard and Seddon’ work.